BOB DYLAN: I listened especially to The New Lost City Ramblers. I took to them immediately. Everything about them appealed to me-their style, their singing, their sound. I liked the way they looked, the way they dressed and I especially liked their name. Their songs ran the gamut in styles, everything from mountain ballads to fiddle tunes and railroad blues. All their songs vibrated with some dizzy, portentous truth. I’d stay with The Ramblers for days. At the time, I didn’t know that they were replicating everything they did off of old 78 records, but what would it have mattered anyway? It wouldn’t have mattered at all. For me, they had originality in spades, were men of mystery on all counts. I couldn’t listen to them enough. On this particular day, we were just sitting around talking and Flo Casstner asked me if I’d ever heard of Woody Guthrie. I said sure, I’d heard him on the Stinson records with Sonny Terry and Cisco Houston. Then she asked me if I’d ever heard him all by himself on his own records. I couldn’t remember having done that. Flo said that her brother Lyn had some of his records and she’d take me over there to hear them-that Woody Guthrie was somebody that I should definitely get hip to. Something about this sounded important and I became definitely interested. All these songs together, one after another made my head spin. It made me want to gasp. It was like the land parted. I had heard Guthrie before but mainly just a song here and there-mostly things that he sang with other artists. I hadn’t actually heard him, not in this earth shattering kind of way. I couldn’t believe it. Guthrie had such a grip on things. He was so poetic and tough and rhythmic. There was so much intensity, and his voice was like a stiletto. He was like none of the other singers I ever heard, and neither were his songs. His mannerisms, the way everything just rolled off his tongue, it all just about knocked me down. It was like the record player itself had just picked me up and flung me across the room. I was listening to his diction, too. He had a perfected style of singing that it seemed like no one else had ever thought about. He would throw in the sound of the last letter of a word whenever he felt like it and it would come like a punch. The songs themselves, his repertoire, were really beyond category. They had the infinite sweep of humanity in them. Not one mediocre song in the bunch. 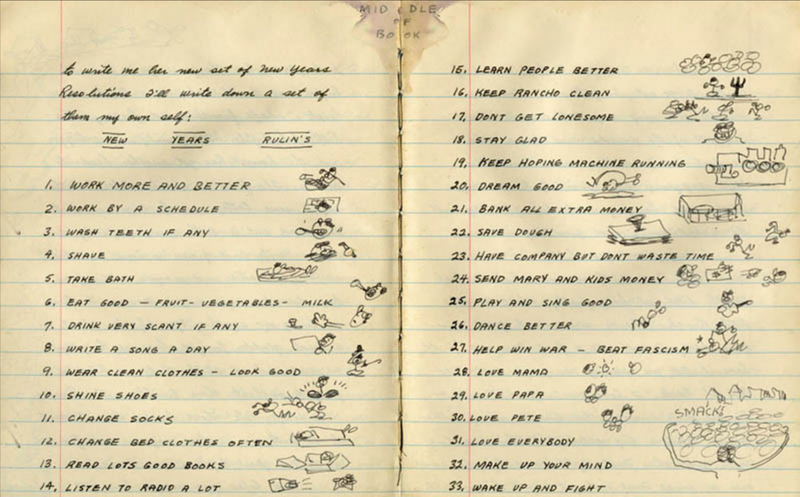 Woody Guthrie tore everything in his path to pieces. For me it was an epiphany, like some heavy anchor had just plunged into the waters of the harbor. That day I listened all afternoon to Guthrie as if in a trance and I felt like I had discovered some essence of self-command, that I was in the internal pocket of the system feeling more like myself than ever before. A voice in my head said, “So this is the game.” I could sing all these songs, every single one of them and they were all that I wanted to sing. It was like I had been in the dark and someone had turned on the main switch of a lightning conductor. Thanks to Eli Smith at downhomeradioshow.com for producing a fine tribute to Woody Guthrie. You can listen to the show here. July 14th, 2012 will mark the 100th birthday of the great songwriter, author and artist Woody Guthrie. On today’s show we’ll honor Guthrie by playing a number of his songs and taking a look at some of the sources for the melodies he used and influences on the style in which he played and sang. The least explored area of his work are his actual musical sources. Woody Guthrie wrote very few original melodies, he took melodies of old folk songs and other songs and rewrote them with his own words to make them his own and into the songs we know today. By making these juxtapositions of Guthrie’s songs and their sources (probably Guthrie’s favorite pieces) I hope to place Guthrie aesthetically as an old time / “hill billy” musician much like the other performers featured on today’s show.